We are back with the Take it OR Leave it series! Here is a recap for the newcomers. When I enter a store my eye is immediately drawn to the displays. I rarely just got to the racks and start digging through. I like to take the easy way out and just buy the outfit. Unfortunately for me it doesn't always work out the way I would like. After all what size are those mannequins anyway?!! My mother tends to shop the same way so for years we have been playing this game we call “Take It Or Leave It”. Here’s how it works . . . grab a shopping buddy and head to your favorite store. Find a display you love then recreate the look in your size. 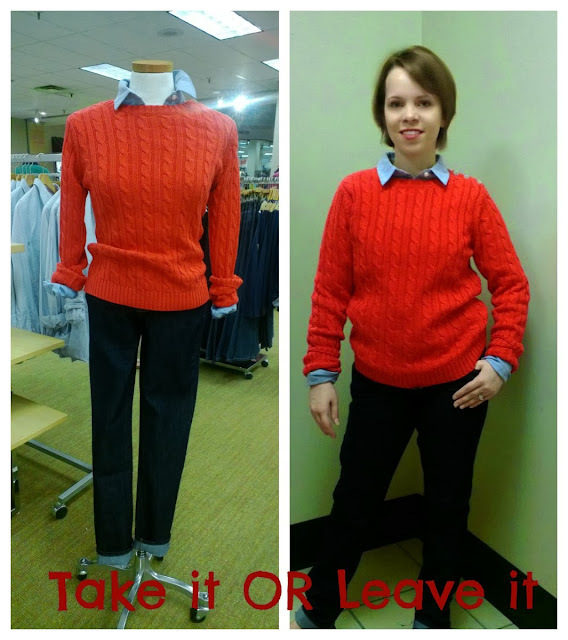 Turn to your shopping buddy and simply say, “take it or leave it”. Then trust their judgment! What do you think…Should I take it or leave it??? I'd leave it. The shirt adds too much bulk.